The December 4th Project – Volume 4 – MixTape | DJPetey.com!!! The wait is over! 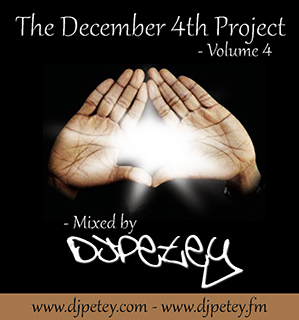 I finally got a chance this morning to put the finishing touches on “The December 4th Project – Volume 4”. You know the drill by now. Im trying to make the ultimate box set here! Once a year, we get an addition. As always, you can stream and/or download the mix over at www.djpetey.fm (HERE is the direct link). If you wanna check out the track listing, click “read more” below. Also, if you like it and wanna go back and listen to volumes 1-3, Volume 1 is HERE, Volume 2 is HERE, and Volume 3 is HERE. Hope you enjoy!